Ag ynyr amser hwnnw i ddoedd kored i Wyddno Garanhir ar y traeth rwng Dyvi ag ystwyth geyr llaw i gastell i hvn ag yny gored honno i kaid gwerth kanpynt bob nos glamai. And in that time Gwyddno Garanhir had a fish weir on the beach between [the rivers] Dyfi and Ystwyth beside his own castle, and in that fish weir was had a hundred pounds [of fish] every May eve. Ag yn yr amser hwnnw yr oedd gored Wyddno yn y traeth rrwng Dyfi ag Aberystwyth garllaw ei gastell ehûn ag yn y goret honno y kaid kywerthyd kan punt bob nos kalan Mai. 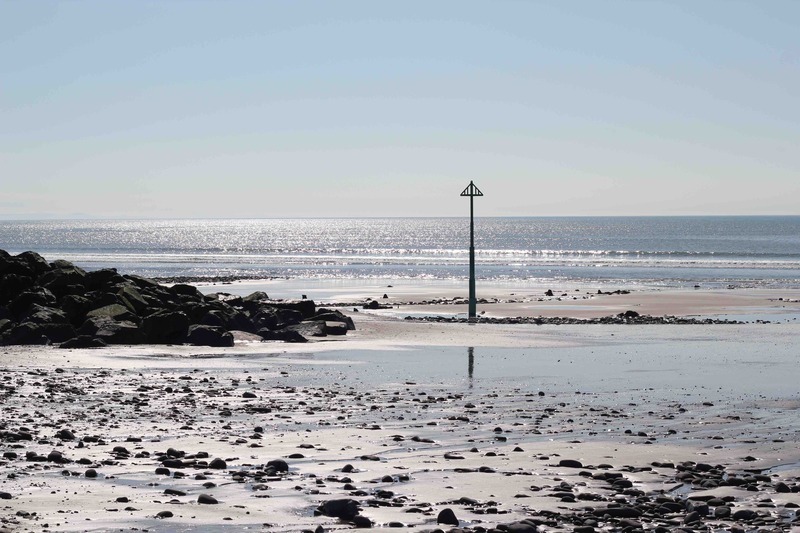 And in that time Gwyddno’s fish weir was on the beach between Dyfi and Aberystwyth beside his own castle and in that fish weir [a catch] to the value of a hundred pounds was had every May eve. 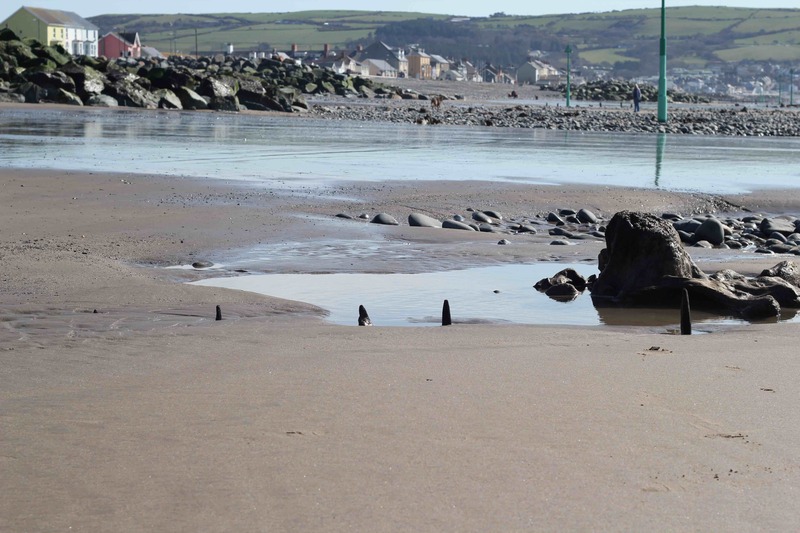 In 2012, the sea breached the defences at Borth, causing much flooding. Soon after, the work of building new sea defences was undertaken on the beach. As always, the building contractors were obliged to have a team of archaeologists investigating anything of interest dug up during the course of their work. 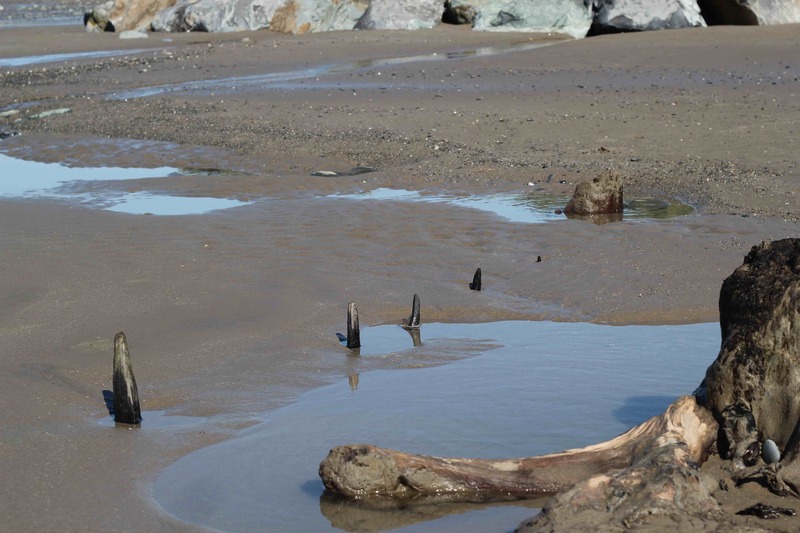 The tops of four stakes from the fish weir found by Dr Bale. The fish weir next to a petrified tree stump. The sea defence boulders on the left were placed over part of the fish weir. The tide marker is just to its right. As I’ve described in earlier posts, the whole area surrounding Cors Fochno and the Dyfi estuary sounds with echoes of Taliesin’s myth. If Patrick Ford’s arguments in Ytsoria Taliesin (UWP 1992) are to be taken seriously, then the early hero Cynfelyn may have been Taliesin’s teacher and initiator. 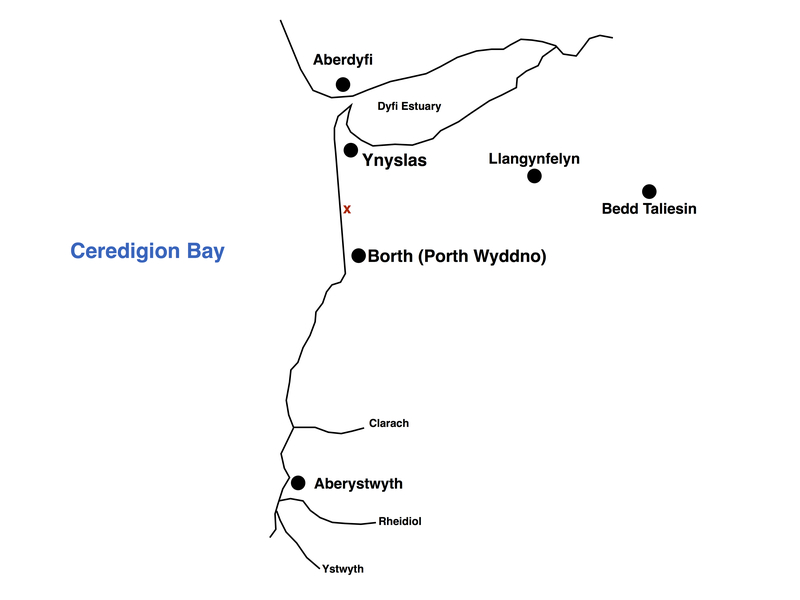 Cynfelyn, as is typical of some of these early figures, became a saint who’s church is only a few miles away inland at Llangynfelyn (see map above). ← A short note on translation . . .
Oh wow, so there really was a fish weir in the area Taliesin was found! Was this the same flooding that exposed more of Cantre’r Gwaelod? Yes, the storm revealed more of the petrified forest, although I would guess its been revealed before several times in the past, probably resulting in a rekindling the old folk memory of Cantre’r Gawelod, and of the rivers Lli and Archan.